ENROLLMENT FOR OUR 2019 SUMMER OF REBELLION IS NOW OPEN! Adapted and Directed by WYCKHAM AVERY, from the national book award winning novel by William Alexander. Hoping to find his lost brother, Rownie escapes the home of the witch Graba and joins a troupe of goblins who perform in Zombay, a city where humans are forbidden to wear masks and act in plays. Launched last year at our Third Annual Greenhouse Initiative, this show will feature clowning, circus and physical theater. Winner of the National New Play Network’s 2016 Smith Prize, this site-specific production brings us to Tavistown, New York, where a recent tragedy has rocked the community to its core. Narrator and town historian, Zoe, recounts the days leading up to the incident, as the high school prepares for the semi-annual production of Thornton Wilder’s Our Town. Jennifer Barclay’s new play is a stunning narrative about community in the wake of unspeakable devastation. What is more real, the lives that we lead in “the real world”or “the online world”? Combining the use of high-tech gaming technology and low-tech theatricality, URL vs. IRL will follow a group of teenage characters as their lives intersect and collide online and off. The 1-8 pm rehearsal block will be split between both shows. Written and Directed by Artistic Director Jared Mezzocchi with music by local artist, Duncan Pelletier. When a group of girls want to shake things up in their high school by creating a new sports team, they are met with a series of unexpected set backs. What’s the big deal with an all-girls high school wanting to join the rest of the New England prep school league in a sport that has been around since the American Civil War? Join this group of rule-bending, form-smashing, heart-crushing girls as they line up against their All-American, Undefeated, “Nothing-Has-Ever-Been-In-Their-Way” team of Boys. Yes, this gang of female bandits has started a football team, named “The Resisters.” 11 men on a field, they say? Hut hut, HIKE! 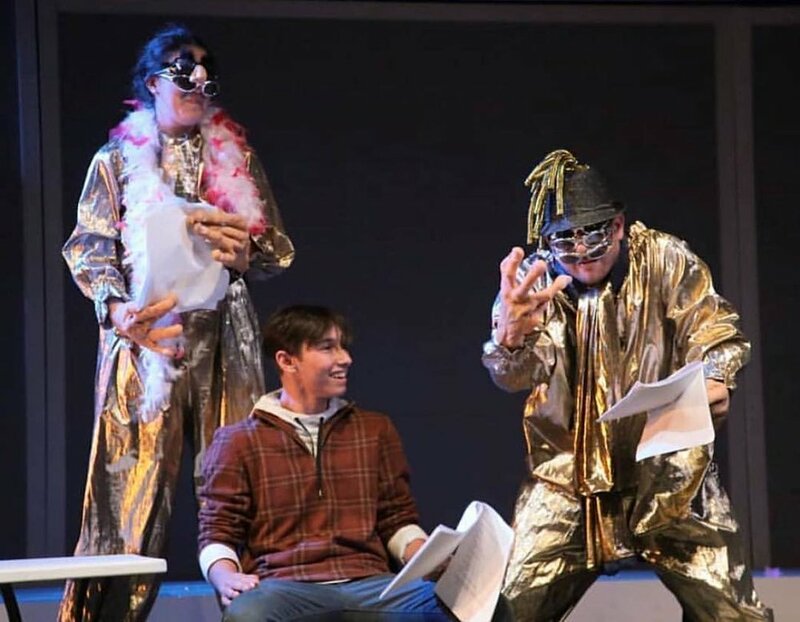 A photo from 2018’s Academy performance, in which artistic director, Jared Mezzocchi, and administrative director, Katerina Klavon, were cast as aliens in a scene written by Siraj Husainy (pictured) and woody Stockwell. Andy's Academy is a one night showcase highlighting work produced in our Workshop series throughout the summer. This year's event features performances from our directing Workshop, original works from our playwriting Workshop, and a viewing of the piece produced during our film workshop.